What do you mean? This IS the easy way! 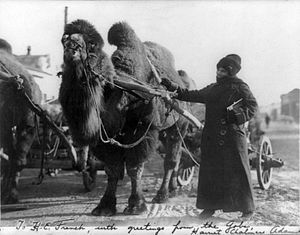 With the Sahara complex finished – including several lesser manses at critical points to either supplement the effects of the keystone manse and it’s Sahara Sea or to preserve localized swathes of desert to provide permanent refuges for the desert-dwelling species and ecosystems – Elzeard had moved his operations on to the Gobi Desert. Unless there was major interference to call him back, greenery would soon spread across the Sahara, Arabian, and Syrian deserts as the climate feedback loops reversed themselves – and the fertile crescent would soon once more be lush and wet. The Gobi, while considerably smaller, was a more complex project. The rain-shadow of the Himalayas called for a string of manses high in the mountains along the desert border to replace the moisture that the highest peaks had taken – sending cooling mists and humid air rolling down to become rain and dew in the desert below. Several other manses would, once again, become conservatories for the (relatively few) creatures of the desert. Just to be ready, his surveyors were mapping the essence-flows of the Kalahari in preparation for getting to work there after the Gobi manses were finished. In Aden, he was subtly tinkering with Charles… Extending your childhood was all well and good, and remaining a young and healthy adult eternally was just fine – but remaining a perpetual small child would be missing out on a lot of important things in life as well as failing to live up to his species and ancestral responsibilities. Over the next few decades he’d be quietly slipping a few years past the life-supporting geomancy. That couldn’t work against active resistance of course – but he was already working from the inside. Gothmug was gloomily planning to ensure that Charles – no matter how much he liked magic and disliked physical activities – got plenty of exercise, and advanced combat training (if necessary by having creatures leap out at him unexpectedly! ), and military studies. While Charles might somehow manage to ever getting into a fight it didn’t seem likely – and even a Solar Exalt on a Primordial Path of Transcendence needed to be prepared! Malinda wanted Charles to learn about social networking, and about doing some checking on people before he gave them massive powers, and considered it pretty urgent. What with the child wandering about handing out Adenic Thaumaturgy to anyone who asked, combat training could wait! It wasn’t like they couldn’t look after him quite effectively! Seiden Starswarm (Master of Energetics, Science, and Technology) wanted Charles to learn a great deal more about the default physics of the cosmos. Working within the rules as much as possible allowed you to stretch your power and influence a great deal further, and to keep the magical disturbances you created to an absolute minimum – and there were a lot of things that didn’t actually need magic at all if you were clever. Sure, a manse that provided city services in it’s zone of influence was good – but one that simply let machinery operate without fuel or maintenance and facilitated recycling within that same zone… With a modern distribution grid, that could provide power and services across a continent! Chaffri the Far Traveler (Master of Travel Thaumaturgy and Gates) wanted Charles to see a lot more of the universe and meet new people and experience alien cultures – but did concede that getting the network of world-gates up and running was also of great importance. That would let a LOT of people see new worlds… For the moment, he was contenting himself with quietly spreading rumors that soon land would be made available to the poor – and with making preparations to train and equip colonists. Even with some city-manses there to welcome them, they would need some education in pioneering once they started to spread out to claim their new worlds! Fortunately, a lot of the final equipping and training facilities could be set up on the new worlds; they didn’t need to be on Earth. Still, when the gates opened, there should be people who would be ready to use them! Mishinago, at least, thought that there was no great rush on the self-improvement; after all, Charles was really rather young, and was already doing quite well in that category; he’d created THEM from the energies of his own soul hadn’t he? It was hard to get much more personal about self-improvement than THAT. He’d wait and see a bit. After all, there were quite a few things to do – especially since he, unlike Elzeard, had opted for “subtle”… As long as you worked in a series of small steps things like cleansing pollutants from the Earths atmosphere, cleaning up rivers and sites where mining and industrial wastes had poisoned the land, desalinating the soil in long-irrigated areas where salt had been drawn up from the deeper levels, and refreshing selected mineral resources could pass almost unnoticed – especially with Elzeard’s activities to distract the scientists. His quiet tour had already covered much of Eurasia and the Far East. Meanwhile, in Aden, the youngsters from the religious indoctrination camp had settled in nicely. They’d believed that their parents were crazy anyway – and being kidnapped by weird elves, turned furry, “rescued” by some merlin-kid, and taken to a world full of creatures out of “fantasy” novels pretty well proved it! Their parents had no idea at all of what was really going on! They hadn’t put up any resistance to what amounted to “boarding school”. They got to have (slightly censored) contact with their friends “outside”, there were any number of amusements, there were places to shop (and an allowance to do it with and some quite fantastic things to buy), and Aden was more comfortable than anywhere they’d ever been… Sure, the “Inukami”, “Baalgrogs”, and “Kickaha” insisted on a certain amount of discipline and study / practical training – but it was no worse than most schools were, the facilities were incredible – and the courses… The place was offering serious courses in starship piloting, planetary surveying, alchemical transmutation, and a hundred other fantastic topics in addition to everything a normal school might offer. The Baalgrogs basic plan was just to keep them in school until they were old, sensible, and unmutated, enough to go – or until they decided to join one of the other groups (thaumaturgic trainees, Kickaha, or whatever). It was a trifle sad, but the world wasn’t yet ready for mutated kids returning from the dreams of the fey (in fact, it was quite likely that the Dragon-Blooded, or others who preferred secrecy, would eliminate such troublesome individuals) – so “kept until you’re either ready to release or have adapted to being kept” was pretty much the reality of the situation. The youngsters who’d been willing – or at least accepting – property of the Raksha had been a different sort of problem – and Charles (apparently in a hurry) had just said “take care of the new pets!” when he’d dropped them off. There had been a sort of triage operation. Some didn’t need attention; they’d just seen no point in trying to fight the Raksha armed with nothing but an uncooperative attitude. Those had simply been shunted off to boarding school to learn to be productive, independent, people again. Most of the rest… They were accepting of being subordinate property in the “servant” role – and more or less expected to run errands and be decorative background props for their owners. They’d probably learn independence eventually (with a little pushing), but there wasn’t any rush about it. In Aden they had plenty of time. Quite a few had been recruited as (possible) Kickaha – while the rest, depending on the whims of whoever’d taken them for training, were now serving as package runners (in fluffy cheetah-morph forms), tour guides (as fluffy raccoon-morphs), library assistants (mostly as fluffy ferret-morphs), and servants at inns (as fluffy cat-morphs). After all, the trainers did all know that Charles liked fluffy furry things – and his having given all the “pets” Resplendent Butlers Accouterments made it easy to cater to the preference. There were some very young ones, but they were just put into school to see how they turned out. Finally, there were a few who were quite hopeless – born with terrible weak minds, so badly abused that they had fled from humanity to take refuge as a Raksha pet, a few who were simply happy being pets (and having no responsibility for anything), and a few – apparently born to the role – who simply knew nothing else. Elzeard had taken charge of them. Elzeard was well aware that Charles DEFINITELY wouldn’t want them mistreated – and would want them to grow up to be “people” rather than “pets” eventually – but that would almost certainly be a long term concern. A youngster Charles’s age SHOULD have some pets, and the boy wouldn’t worry too much about them for the moment. He had a universe to fix, and as long as the “pets” were content with their positions, what those positions were… really didn’t matter much for the time being. They could wait – and Elzeard could make them EXTRA FUZZY. Elzeard had known that Charles would never be able to resist the fluffy. Hm… six girls, four boys, all pre-pubescent youngsters. The intent seemed to be to give him living teddies around his own size that would be entirely happy to be cuddly pets and to frolic around Aden. Charles named her “Silky” and named the rest of them and told them to go and play for the time being while he talked to Elzeard! Huh… It looked like… the ones with the Kickaha were having to… earn the privilege of joining the packs. Young kids were right out. Probationary Omegas? Charles hadn’t known that there WAS a pack position below Omega! Ah. There wasn’t until the “pets” had some along. It looked like they were… carrying the packs goods, learning how to fight, and doing the actual Omega’s chores and things for them. The Omegas quite liked that part – but it seemed to be a stopgap while the pack leaders determined what to do. They could tell that these kids were a bit different from the way they were, at least mentally. He might as well drop by and explain! The Pack Alpha considered that carefully. The Alpha seemed to find that just a tad unbelievable. Oh well! Might as well demonstrate! Some mental probing, and a few test orders, were quite revealing. It was the Alpha’s turn to sigh. Oh well! It wasn’t like they didn’t have space, and they MIGHT eventually grow out of it! Given that his Guardians are all him, I doubt that thier efforts will have much of a pronounced effect. What I mean is that each of them is a different bit of Aden’s primordial psyche, and their goals are probably something he would do anyways, given time. In short, I don’t think he’ll change as much as they would want him to, just simply become more competant in those areas. Oh yes – and just like Charles and his obsessions, his Guardians want him to focus on their particular fields of interest right NOW – spending his experience buying relevant skills and charms and spending his time building related tools and manses. If he is slowly becoming a “true primordial” then I suppose, in an odd way, they’re competing to see who ultimately gets to be the “Feitch Soul”. A few do have more easily-achieved secondary goals of course, such as Elzeard wanting him to at least get to fifteen or sixteen before giving up on aging entirely. I’m thinking they’re in for a dissapointment on that part. After all, he does have a certain aspect that existed long before the Guardians, even if it hasn’t manfested a physical form yet. Sadly, despite Charles having taken Dreaming Narrative Conquest long ago (it seemed like such an interesting idea) our theoretical Raksha has yet to actually appear – mostly because trying to use Graceful Wicked Masques to actually build the character is something of a nightmare. If building him using Graceful Wicked Masques is too much of a pain, then don’t. Seeing as how he’s likely to be a unique entity try building him as a spirit or a god. Albeit a spirit with graces and access to Raksha charms, but still if it’s taken that long you might as well take a few liberties. Though it’d probably have to be looked over to determine if it would be the same general power level as what you’d get with GWM. Oh well. I shall take another crack at it and see what happens. If you’re having trouble finding a Assumption charm that works thematically, you could probably make one up to fit an Adenic theme. Oh, that’s not that difficult – the Bestial Assumption fits in with Charles notions well enough. The problem with GWM (and the errata which basically replaces half the crunch in the book) is that I keep wondering “will this charm do what I want?” or “how can I do this?”, giving up on making something unambiguous out of the rules in the book, and consulting the white wolf forums – whereupon, after several hours, I come up with a raft of posts – some saying “yes”, some “no”, some “maybe”, and a LOT then saying “but…” and then proposing a wide variety of fixes and interpretations. Usually no two the same. On the other hand, yesterday I pretty much decided to give up on that and interpret things in any way that looked reasonable to me, and that’s allowed for a lot more progress.